Iraq Central Bank announced last week for printing new bank notes contain signs of additional security make it difficult to counterfeit or tampered with. These include security tags added security thread, a colorful stripe width of one millimeter small cash currencies and four millimeters of large, colorful filaments are visible and the other does not see only through the use of detection devices, according to what he said. Add to sign a sophisticated, high-quality know Balspark in place in several countries of the world, according to Yasiri. He Yasiri that these features will contribute to enhancing the protection of Iraqi funds from counterfeiters and manipulators. To enable citizens blind and visually impaired circulation of the new currency and excellence, it contained a prominent signs or protrusions. It was also repainted and a protective material to prevent damage due to continuous trading them, according to Yasiri. 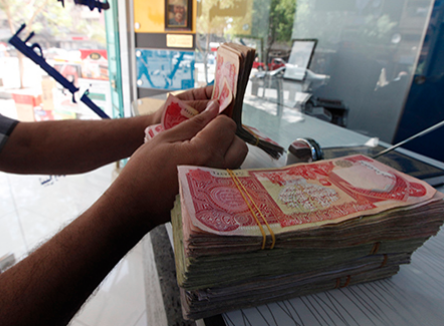 Yasiri said that the total value of banknotes will be printed at around five trillion dinars (4.3 billion dollars) will be pumped circulation categories used instead of gradually. Indicates economic expert on behalf of Jamil Antoine to reprint the Iraqi currency after several years developed was a “prerequisite”. Antoine explained that there are a lot of techniques and modern labels that have been introduced in recent years in the world to fortify the currency of fraud and manipulation. He believed that it is necessary to increase awareness of the characteristics and specifications of the new categories of cash and the statement of the importance of re-printing the currency and encourage circulation. In turn, welcomed member of the Economic Committee in the House of Representatives MP Ibrahim stirrup step the Iraqi Central Bank, and considered the process of renewal of the currency is a good step towards the achievement of monetary reform.